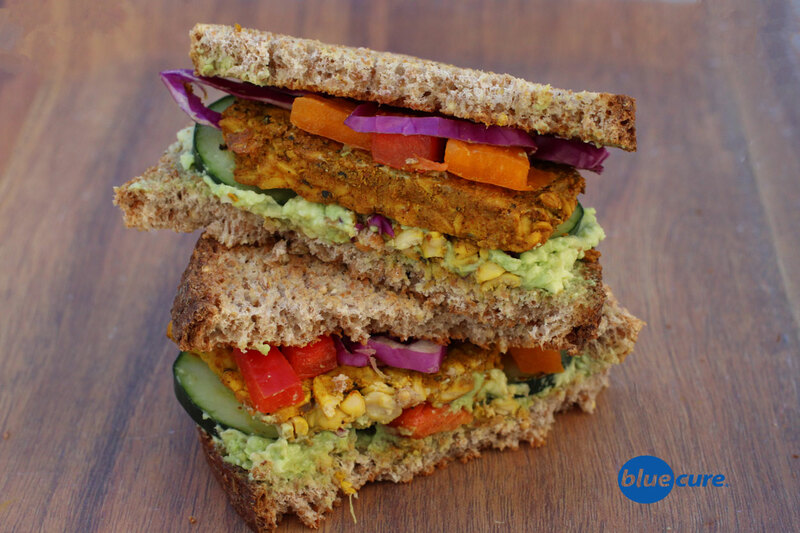 A savory tempeh with raw veggies and avocado. This sandwich is packed with protein — and balanced nutrition; whole grain bread, healthy fats, plant-protein, and veggies. The tempeh recipe would also taste great with quinoa and roasted veggies. Give it a try! Cut the tempeh into 4-8 slices. Cook in a pan on medium-low heat for a few minutes. Be sure to flip sides. In a bowl, combine the nutritional yeast, braggs, chili powder, turmeric, and black pepper. Add in 2-3 tablespoons of water and stir well. Pour the mixture over the tempeh and reduce the heat. Cook for a few minutes on low heat to let the water cook off. (*You can add an additional tablespoon of water, if needed– but avoid adding too much water). The mixture will thicken up quickly, so flip the tempeh often. Remove the tempeh from the heat and allow to cool. Wash and chop the veggies. Toast the bread. Slice the avocado or mash and spread it on the bread. Layer with the rest of the ingredients. Enjoy!